"His sense of humanity was stronger than his torture." Mohamedou Ould Slahi spent 14 years of his life as a detainee in the United States military prison at Guantanamo Bay Naval Base. While he was held at Gitmo, Slahi was repeatedly tortured in an effort to extract information about his ties to Al Qaeda, as well as family members’. Most notably, his cousin, Mahfouz Ould al-Walid, served for a time as Osama Bin Laden’s spiritual adviser. Slahi denies having any personal involvement in terrorism. On Sunday, 60 Minutes correspondent Holly Williams spoke with Slahi about his experience as a detainee and his subsequent release in 2016. The experiences Slahi reports from his years of detention are difficult to stomach. They include sleep deprivation, sexual humiliation, mock execution, and relentless interrogation. During his time at Gitmo, he provided a false confession just so the interrogators would stop torturing him. Slahi’s experience was not unique. In fact, it was the product of extensive research and development, which included onsite psychologists at Gitmo who advised interrogators. 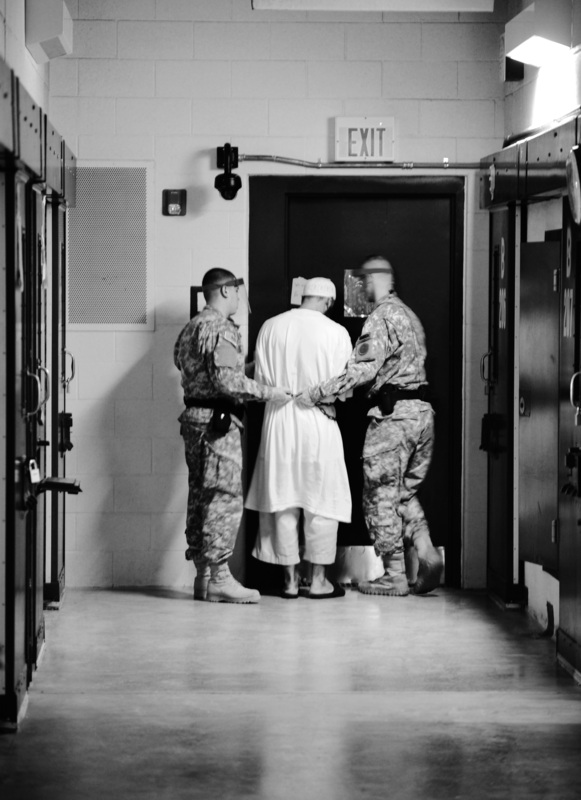 The International Committee of the Red Cross took this photo of Mohamedou Slahi at Guantanamo Bay for his lawyer. While the Pentagon employed psychologists to aid in interrogation, other psychologists have spent their careers helping survivors pick up the pieces. Dr. Steven Reisner has spent the last 17 years treating survivors of torture. For Reisner, the son of a Holocaust survivor and a former Soviet prisoner, counseling victims of torture has been a lifelong effort, even before it was a profession. He tells Inverse that the United States government actually created its own unique definition of torture in order to justify the activities at Guantanamo Bay, Abu Ghraib, and the so-called CIA black sites. “The first thing that they did was define torture based on it having severe and lasting effects on the subject,” he tells Inverse. In other words, government officials defined torture by the effect it had on a person, as opposed to what an interrogator was doing to that person. By asserting that detainees such as Slahi had been brilliantly trained to resist interrogation, Pentagon officials and operational psychologists argued that they could employ brutal techniques on detainees — techniques that would be classified as torture under the definitions set forth by international law — without any negative long-term effects on detainees’ psychological states. By that definition, the so-called “enhanced interrogation techniques” to which Department of Defense operatives subjected Slahi and other detainees would fall clearly under the umbrella of torture. Besides the fact that torture represents a gross violation of human rights, it’s also an ineffective way to gather intelligence. Reisner says that Slahi’s case illustrates one of the weaknesses of torture. Reisner says this aspect of torture-induced confessions sent the FBI on hundreds of wild goose chases following the terrorist attacks of September 11, 2001. The U.S. government started torturing terror suspects, therefore generating a massive number of false leads when suspects would make up terrorism targets. Whether it was a shopping center or the Brooklyn Bridge, suspects would name any place they could think of, just to make the torture stop. When Slahi relates his experiences at Gitmo, it’s no wonder that a torture victim would say anything to try to stop the pain. He describes a particular incident of physical violence in detail. “Inside your uniform. Ice cube, full. My body was full. And then I was like shaking uncontrollably like this. They start hitting me everywhere, hitting,” he tells 60 Minutes. He estimates that he was beaten for three hours that time. "The aim of the torture is to induce a kind of temporary insanity," says psychologist Steven Reisner. The torture was not just physical, though. Operational psychologists worked alongside interrogators to exploit detainees’ vulnerabilities. At one point, interrogators even told Slahi his mother could be held at Gitmo because he wouldn’t confess. He was beside himself with fear and anxiety. According to Reisner, inducing this kind of intense mental distress is precisely the goal of interrogators’ techniques. Reisner says the old CIA torture manual used in Latin America in the 1980s warned against this kind of psychological distress for the same reasons we’ve covered: There’s no way to judge the information obtained from someone who is experiencing intense psychological regression. The manual even cautioned that a psychologist should advise interrogators. “As far as I know, that was the first indication that the CIA believed that psychologists were an essential part of the torture program,” he tells Inverse. Beyond just the acute effects of torture, Reisner says the long-term effects can be devastating. This includes the intense shame, guilt, and confusion that can come from betraying one’s values and beliefs under torture. These psychological effects are especially severe in people who remain imprisoned after being tortured, since they are unlikely to receive the care they need to heal. Psychologists’ role in interrogation became the subject of public debate in 2015. This followed the publication of an independent report that outlined how members of the American Psychological Association had “colluded” with the Department of Defense to ensure that psychologists could remain a part of interrogation programs. The APA issued an apology, but for survivors, the lasting damage is already done, in the form of post-traumatic stress disorder. For many survivors of torture, though, life can go on. Reisner says Mohamedou Slahi is an example of someone who shows signs of resiliency, despite the years of intense torture he suffered.